Shining crystal chandeliers, round tables elegantly draped with white linen tablecloths and accessorized with exotic flower arrangements in red pots and candles in silver candlesticks, sumptuous white fabric swathed floor to ceiling windows and antique mirrors completed the romantic ambience. Rome, or Roma as it is known in Italian, is a romantic city, where lovers of all ages walk hand-in-hand or arm-in-arm, and since the old adage goes, “there is no better way to a man’s heart then through his stomach,” restaurants pull out all the stops to create the perfect atmosphere for amare. 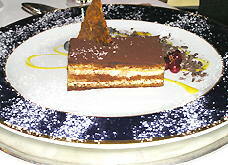 In late October 2004, Edward F. Nesta and I shared a very romantic dinner at La Veranda at the Hotel Majestic Roma, www.hotelmajestic.com, located at Via Veneto 50. The mood was set as we entered the charming dining room on the strains of a love song being played by the pianist in the foyer. Shining crystal chandeliers, round tables elegantly draped with white linen tablecloths and accessorized with exotic flower arrangements in red pots and candles in silver candlesticks, sumptuous white fabric swathed floor to ceiling windows and antique mirrors completed the romantic ambience. 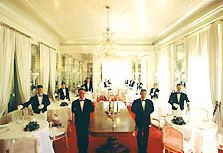 The service was formal and discrete, and the wait-staff were attired in white dinner jackets, black trousers and black bow ties. After we were seated at our table, Primo Maître, Andrea Lombardi, suggested that we begin our evening with an aperitif of Tenuto S. Anna Prosecco, a very aromatic vino spumante with 11.5% alcohol, which we savored with an assortment of canapés. An amuse bouche followed of two perfect tuna rolls wrapped with ham in a basil sauce. For our next courses we selected King prawns grilled with thinly sliced mango, and Carpaccio of grouper with black olives and capers, for which Primo Maître, Andrea Lombardi then recommended a Sicilian wine, Duca Enrico Nero Diavolo, which had a very balanced nose, exhibited long legs, and had a mature deep cherry, blueberry flavor with a hint of spiciness, and complemented both of the courses, which were beautifully presented on square glass plates. 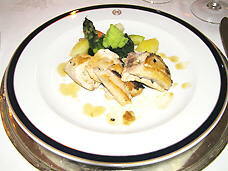 The wine also worked very well with our next courses of Swordfish with marjoram, asparagus, carrots, potatoes and spinach and Lamb with Jerez vinegar and blueberries served on a bed of spinach. We took a short interlude and listened to the music before we indulged in the dessert course. For dessert, we had selected the orange parfait garnished with caramelized almonds and the homemade tiramisu set on a bed of vanilla sauce and garnished with bitter chocolate. Following the Primo Maître’s recommendation again for the dessert wines, we selected another Sicilian wine, this time a Malvasia delle lipari 2001, Hauner, 12.5 % alcohol, which was a delicious sweet white wine made from up to 95 % Malvasia di Liapri grapes and 5% Corinto Nero grapes, which was a delightful companion to the orange parfait, and a Bonaventura Maschio Prime Arance Acquavite d’arancia, 40% volume to pair with the tiramisu and the bitter chocolate. Although the desserts were wonderful on their own, paired with the dessert wines that were pure indulgence, and worth every drop. After dinner, we had the opportunity to meet with Executive Chef Gaetano Costa, who graciously agreed to an interview and also kindly agreed to share two of his recipes with Luxury Experience magazine, which you can read about in Chefs’ Recipes. Read our other articles on the Hotel Majestic Roma and Rome in Destinations, Hotels & Resorts, Chefs’ Recipes, Restaurants and Music Scene.